B2B market research (also known as industrial research) is the discipline that lays the groundwork for making the right business decisions. If you are looking to grow within your market or expand into new ones, you need knowledge. B2B market research offers a wealth of opportunities to unlock that knowledge. Industrial research is particularly suited to generating reliable and robust analyses about new target groups, market potential, entering international markets and developing new products, including their positioning and distribution channels. The findings gleaned from B2B market research are the cornerstone for market analyses related to developing, changing or continuing business strategies. In the B2B market research segment, we have pronounced expertise in market analyses and market research. At the same time, our market intelligence experts can draw upon 35 years’ of market intelligence experience in bringing their high degree of market expertise to bear in roughly a dozen different sectors. Gathering market and sector information is simply part of our daily business. Market information is frequently gathered using telephone-based expert interviews. Expert interviews are common in B2B market research, their key feature being lower test numbers (small sample sizes) but high-quality discussions. We also analyse data using data base research, including subscription-based data bases not available to the public on the open web, meaning they are therefore harder to come by. The results of our market analyses are always SVP: Strong, Valuable, Precise. Who are the market players and what are their strengths and weaknesses? How great is the market potential and what trends are shaping the different industry segments? What are my target customers’ needs? What are distribution channels are there and how are they weighted? By analysing the market and its participants, the drive manufacturer is able to plan its future position in the market and tailor its portfolio of products and services accordingly. Sample excerpt: The services and products offered by market participants currently supplying industrial customers are investigated and evaluated. In addition, the type of service is categorised (product adjustment or logistical service) and its penetration and value-added are checked. Benchmarking against the competitor landscape makes it possible to calculate how favourable the chances are of contending with existing competitors and gaining adequate market share. As an example, a graphic can be created that shows the drive manufacturer the relative positions of competitors. Based on the relevant target industries, what regions hold the greatest potential and how is each structured? Who are the players currently supplying my target customers with which products, and what are the critical factors on which my target customers base their purchasing decisions? What market developments and trends are influencing the relevant industries in the most important countries? 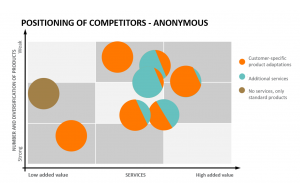 What does the competitor landscape look like and what industries do the competitors supply? Sample excerpt: The sectors within NAFTA depicted using an analysis of national specialty engineering firms (anonymised focus) without foreign subsidiaries. Specialty engineering firms within NAFTA are predominately smaller-sized US companies with 10 to 200 employees, the majority having less than 100 employees. Most are owner-managed companies and have only one location. The regional distributions of the 50 firms analysed can be seen in the graphic. The results of a customer satisfaction analysis (online survey, supported by interviews) can be an important starting point for developing products and services. In addition, your customers’ opinions can help you make changes to services or future product developments. If you know your clients’ needs, then you can tailor your product range to their needs and those of the market. Products that are developed with clients’ needs in mind can be pivotal to the success of a company. A conjoint analysis is a B2B market research tool that makes it possible for you to tailor product development and pricing optimally to meet your clients’ expectations. It is a go-to method for introducing a new product. After combining different product features and options with one another, a variety of ‘different product variations’ can be revealed. By assessing the advantages and disadvantages of the different product variations, a conjoint analysis makes it possible for you to identify the features and options that are especially meaningful for your product. These insights make conjoint analysis a critical tool in product development and pricing policies. Market image is gaining greater significance in the B2B segment. In tight markets with only a few players – or in the opposite situation with lots of players vying for position – image can be a decisive factor in awarding a contract. Image conveys core traits such as tradition, dependability or innovative power, to name but a few. SVP offers bespoke image analysis services for the B2B market. Based on the information it uncovers, you can plan image campaigns to make a positive impact on the market, and enhance recognition, understanding and acceptance. B2B market research, with SVP!